Feb. 17, 2017, 4:58 p.m.
President Trump tweeted Friday that the “fake news” media was an "enemy of the American people." An initial tweet mentioning CNN, the New York Times, NBC and "many more" was deleted and reposted, expanding the list to include ABC and CBS. Trump has had a long-standing issue with the press. While campaigning, he created a blacklist of seven news organizations that were banned from receiving media credentials. And during his first solo news conference Thursday, he called the media "fake" roughly 20 times. But this marks the first time as president that he publicly referred to the media as an "enemy." Mar. 24, 2017, 11:17 a.m. It's a really important vote in President Trump’s fledgling first term. Trump spent much of the week trying to win support from members of the Freedom Caucus, among the most conservative lawmakers, some of whom are holdouts because they believe the bill does not go far enough. “After seven horrible years of ObamaCare (skyrocketing premiums & deductibles, bad healthcare), this is finally your chance for a great plan!” Trump tweeted Friday. But even some in conservative media aren’t all that thrilled about the bill. So, it’s been clear in recent weeks that the right-wing website Breitbart does not like the new healthcare proposal. Feb. 27, 2017, 2:19 p.m. The nation’s new top telecommunications regulator wants to halt tough Internet privacy rules before they begin taking effect this week, arguing they would unfairly impose tougher requirements on broadband providers than on websites and social networks. Privacy advocates and a key Senate Democrat vowed Monday to fight the move as well as a separate effort in Congress to overturn the regulations, which were approved in October on a party-line vote by the Federal Communications Commission when it was controlled by Democrats under President Obama. Following President Trump’s inauguration, control of the commission passed to Republicans and Ajit Pai took over as chairman. Feb. 27, 2017, 1:58 p.m.
President Trump is often loath to accept responsibility when things go wrong, but in the case of Sunday's Oscars broadcast, he made an exception. As he explained it Monday, it was Hollywood's obsession with attacking him that contributed to the botched best picture announcement, calling the embarrassing episode "sad," of course. Accounting firm PricewaterhouseCoopers has apologized for the mix-up that led Warren Beatty and Faye Dunaway to announce "La La Land" as the winner of the top Academy Award prize, instead of "Moonlight." Feb. 27, 2017, 1:24 p.m. The Trump administration has scaled back its assault on a strict Texas voter identification law that federal courts have ruled discriminated against minorities, portending a shift in how the Justice Department plans to pursue allegations of voter suppression. The government revealed its decision in court papers filed in federal court Monday, dealing a blow to civil rights advocates who have relied on federal support to help them knock down the controversial Texas statute. "It's a very concerning signal to American voters about the Department of Justice's commitment to enforcing the Voting Rights Act," said Danielle Lang, deputy director of the voting rights unit of the Campaign Legal Center, which is suing Texas in the case. Feb. 27, 2017, 1:05 p.m.
House Intelligence Committee Chairman Rep. Devin Nunes said on Monday he has seen no evidence from the intelligence community that there was contact between Russia and the Trump campaign. "I want to be very careful, we can't just go on a witch hunt against Americans because they appear in a news story," said Nunes (R-Tulare). "We still don't have any evidence of them talking to Russia." He said the committee has been briefed on the "highlights" of what the intelligence community has found, but is still collecting evidence. 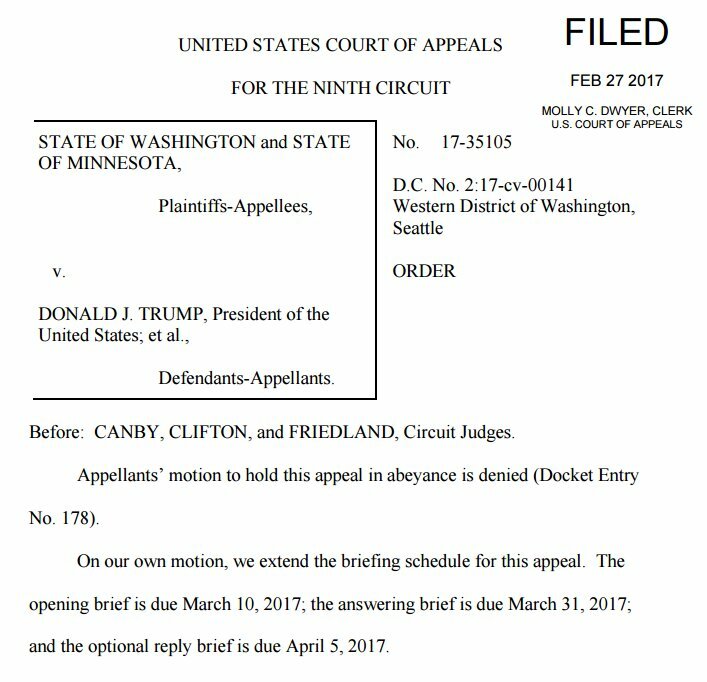 Feb. 27, 2017, 12:39 p.m.
Justice Department's request to pause proceedings in an appeal of President Trump's travel ban. The court in a filing Monday said its schedule for the government's appeal of a lower court's halt on the travel ban will proceed, with the first brief due to the appeals court on March 10. In early February, the Justice Department appealed a Seattle-based federal district judge's order blocking enforcement of Trump's executive action. which established a series of immigration and refugee restrictions aimed at preventing potential terrorists from entering the country. Feb. 27, 2017, 11:35 a.m.
President Trump received some unsolicited advice at dinner with the nation's governors when Virginia Gov. Terry McAuliffe told him he needs to do a better job explaining his policies regarding deportations. McAuliffe, a Democrat and chairman of the National Governor's Assn., told the president that there has been a "chilling effect going on" as businesses stay away from his state and as immigrants fear being rounded up. "If they’re not going to be deported, we need to hear that from the president," McAuliffe said, recounting his conversation from the governors' Sunday night dinner with Trump. Feb. 27, 2017, 9:24 a.m.
President Trump promised the nation's governors Monday that his yet-to-be-revealed replacement plan for the Affordable Care Act would give states greater flexibility and thanked some Republicans in the room who advised him on healthcare. "It's an unbelievably complex subject," he said. "Nobody knew that healthcare could be so complicated." The remark likely surprised state leaders; spending on Medicaid alone was the second-biggest driver of increased state general fund spending, according to the 2016 Fiscal Survey of States conducted by the National Assn. of State Budget Officers. Feb. 26, 2017, 5:43 p.m.
Philip M. Bilden, President Trump’s pick for Navy secretary, withdrew from consideration late Sunday, becoming the second White House nominee to bail on a top Pentagon position due to problems untangling his financial investments. “After an extensive review process, I have determined that I will not be able to satisfy the Office of Government Ethics requirements without undue disruption and materially adverse divestment of my family's private financial interests,” Bilden said in a statement. Feb. 26, 2017, 10:02 a.m.
President Trump claimed Sunday that the race for Democratic National Committee chairman had been “rigged” -- drawing a quick riposte from Tom Perez, who narrowly won the party's leadership race. Trump insinuated that Perez’s DNC victory on the second ballot at a party conference in Atlanta on Saturday was because Hillary Clinton had backed Perez, a former Labor secretary in the Obama administration who was seen as representing the party's establishment forces. Clinton did not make a formal endorsement, but Perez’s rival, Rep. Keith Ellison of Minnesota, was backed by Sen. Bernie Sanders (I-Vt.) and the party's more liberal wing.